The team is putting in work, not just during competitions, but at practices as well. 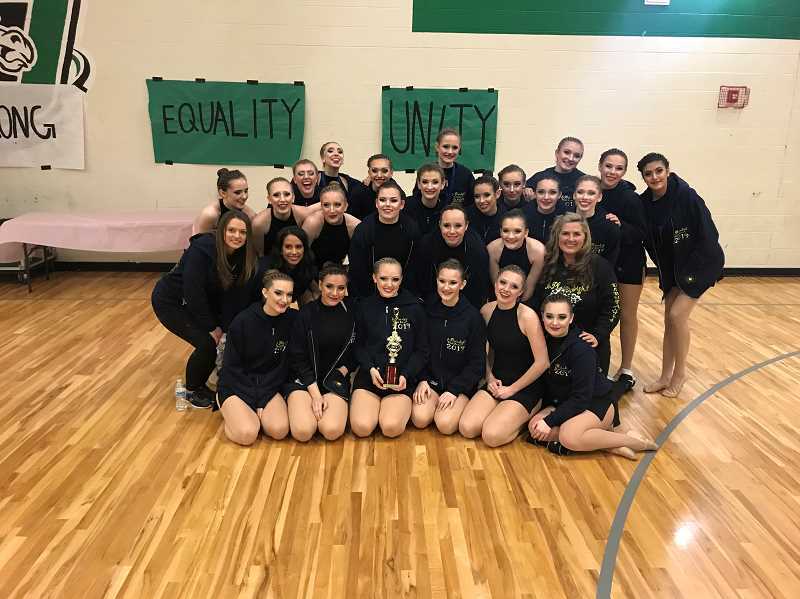 West Linn High School's dance team, the Debutantes (Debs), have finished in the top four at the first two competitions of the spring season, and they have the hardware to prove it. The Debs took second place in their first competition of the spring season, Jan. 26 at Philomath High School. This past weekend, the Debs took fourth place in a competition at Parkrose High School. Debs coach Karalee Kyllo called the team's performance at Parkrose "very strong." "It was a very competitive day with some stellar competitors," she said. While the Debs have been glad to take home trophies at the past two events, these competitions are also a good chance to prepare them for the Oregon School Activities Association (OSAA) state dance competition, which takes place March 15. The team performed just over half of its choreography for the state show this weekend. They plan to perform the rest for the first time at the Metro Dance Competition at Centennial High School March 2. "We have a lot of practices this week, each of them three hours and non-stop. I think being persistent and practicing all the time has helped us get better," Deb freshman Macie Kelley said. Kelley was one of three Debs who earned a spot in the top 10 for novice drill down at the Parkrose competition (medals are awarded to the top 10 in this category but the rankings are not broken down any further). The Debs are expecting their work to pay off when the state competition rolls around next month. "I think we'll at least be in the top six (at state) I hope," Kelley said. "We were up against a lot of really good teams in the last competition and we were able to grab fourth place so I feel very confident in our team at the moment." The Debs want to make sure they give their future competitions everything they've got, so while Kelley is pleased with her team's effort so far, she thinks they can still dig a little deeper. "I'm really proud of our team and I really like being on it and we work really hard," she said. "But I know there is always more we can do to push ourselves and get better but so far we feel very good about ourselves and our places." Even though the Debs are pushing themselves to do the best they possibly can in competition, they know the real reason they dance is to have fun. "I feel as though our team is really motivated and we're all just here to have fun and bond with other people and get to know each other and have a good time," Kelley said.